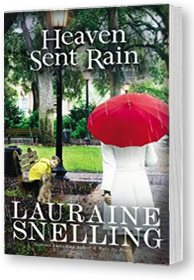 In bestselling author Lauraine Snelling’s new novel, Heaven Sent Rain, Dinah Taylor has an orderly life, and that is just how she likes it. A balanced bank account, a perfectly furnished luxury apartment, a satisfying career as a scientist and CEO of her own company, and an uncomplicated personal life. Then her well-ordered world is thrown into chaos when she finds a seven-year-old boy and his scruffy dog sitting alone outside her office building. To celebrate the release of this heart-warming novel, FaithWords and author Lauraine Snelling are pleased to present the GIVE:JOY Sweepstakes. This sweepstakes features three spectacular prizes, each closely connected to the story, but each prize also comes with a twist: you “Enter to Give”, rather than “Enter to Win”! This is your chance to do something beautiful and make a difference for a friend, family member, shelter, church, or charity. Go to http://www.laurainesnelling.com/html/giveaways.html and complete the entry box, anytime between July 1 and July 21. This giveaway starts July 1, 2014 and ends July 21, 2014 @ 11:59 pm (PST). Entry is open to US residents only, age 18 and over. Winners will be selected Tuesday July 22, 2014, and announced at laurainesnelling.com. Like Jonah’s dog, Mutt, the animals in our lives are priceless sources of help, comfort, and unconditional love. No one understands this better than our story’s hero, veterinarian Garret Miller. Throughout the book, “Dr. G” works tirelessly to save and heal people’s furry friends, including Mutt, and an injured service dog named Valiant. Dinah Taylor has an orderly life, and that is just how she likes it. A perfectly furnished luxury apartment, a satisfying career as a scientist and CEO of her own company, and an uncomplicated personal life. But all of that changes when she meets seven-year-old Jonah. The boy shows up one day, a scruffy dog by his side, in front of her office building. Dinah knows nothing about kids and even less about animals, but after she buys him breakfast, he shows up the next day…and the next. She tries to learn more about him, to help him, but he’s remarkably skilled at evading her questions. And then, late one night, he calls her in a panic–his dog has been badly injured. Dinah rushes them to a local animal clinic, where she meets Garret, a veterinarian with a thriving practice and a passion for drawing. Though Jonah takes to Garret right away, for some reason neither understands, Dinah and Garret just don’t mesh. But for Jonah’s sake, their lives continue to collide, and slowly the relationship between these three strangers begins to change.